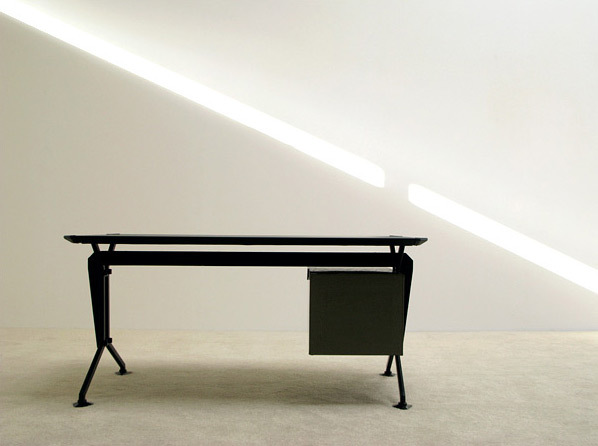 Writing desk, Studio BBPR, formed by the initials of four Italian architects-designers. Gian Luigi Banfi (1910-1945). Ludovico Belgioso (1909), Enrico Peressuti (1908-1976) and Ernesto Nathan Rogers (1909-1968). Period of manufacturing 1963, Olivetti. The desk is complete in original state, 2 drawers at the left with the original key included. Bureau, Studio B.B.P.R. Forme par quatre architecte Italien. Gian Luigi Banfi (1910-1945). Ludovico Belgioso (1909), Enrico Peressuti (1908-1976) et Ernesto Nathan Rogers (1909-1968). Période de création 1963, Olivetti. Bureau en état original avec deux tiroirs a votre gauche et clef original.